Single character. Our bright red test sample of the 10-inch tablet HP Slate 10 HD 3500eg is a special edition that will not be available in Europe. Since it is identical with the normal silver-colored version in every other respect, we put it through our practical test. With the Slate 10 HD HP lays its focus on multimedia: The 10-inch tablet with a resolution of 1280x800 pixels is, according to the manufacturer, perfect for playing back HD videos and due to the Beats Audio HD sound system creates a rich sound. 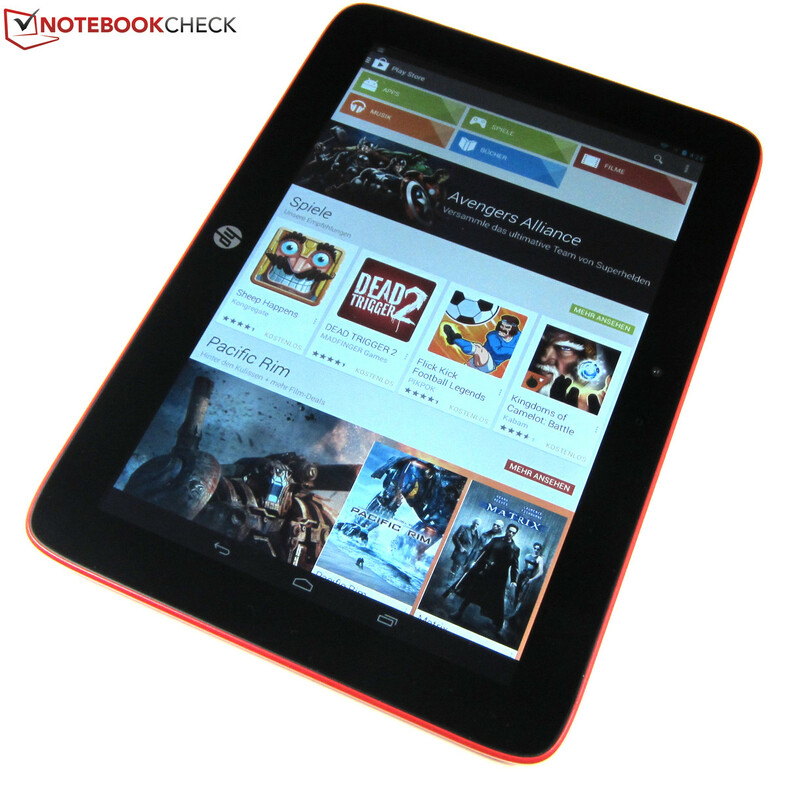 The foundation of the HP tablet's performance, which is equipped with Android 4.2.2, is the dual-core SoC Marvell PXA986, which is accompanied by the dual-core graphics chip Vivante GC1000+. The Slate-10-HD package is rounded off by 1 GB DDR3-SDRAM and 16 GB memory space, which can be extended by up to 32 GB via a MicroSD card. The HP Slate 10 HD has a 10-inch LED display. While the HP Slate 7 was cased with a fashionable metal frame, the HP Slate 10 HD, apart from the glass cover of the 10-inch display, has to make do with polycarbonate at both the case frame and the non-removable back cover. 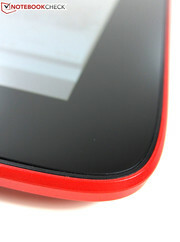 Although the backside is not rubberized it offers a good grip for the fingers due to its profiled surface. The HP Slate 10 can both be slightly twisted and bent. Especially twisting is countered by the display with a distinct brightening at the long sides. Overall, however, the tablet seems by no means fragile and even belongs, with its 630 grams (~1.4 pounds), to the heavyweights. The reference devices are all somewhat lighter, headed by the Samsung Galaxy Tab 3 10.1 with a weight of 512 grams (~1.1 pounds). Additionally, they are also a little bit thinner: The HP Slate 10 is 9.7 millimeters (~0.38 inches) thin, the Asus MeMO Pad 10 FHD only 9.5 millimeters (~0.37 inches) and the Lenovo IdeaTab S6000 even only 7.6 millimeters (~0.30 inches). 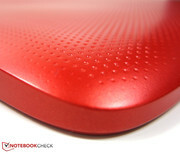 Please note: Those who have always longed for a red tablet and think they have found it in the HP Slate 10 will be disappointed: HP provided us with a test sample with a bright red back cover, which is not sold in Europe. In this part of the world you have to live with a silver case. The HP Slate 10 HD is powered by the dual-core SoC Marvell PXA986, which controls two 1.2 GHz cores on ARM-Cortex-A9 basis. In charge of the 2D and 3D computation is the graphics chip Vivante GC1000+, another dual-core processor. The SoC has 1 GB main memory (DDR3-SDRAM) at its command. Of the nominal 16 GB system memory 12 GB are left after the deduction of Android 4.2.2 and various preinstalled apps. Those who require more capacity, for example because they want to have many songs, pictures, videos and games on the tablet, can extend the system memory by up to 32 GB via a MicroSD card. 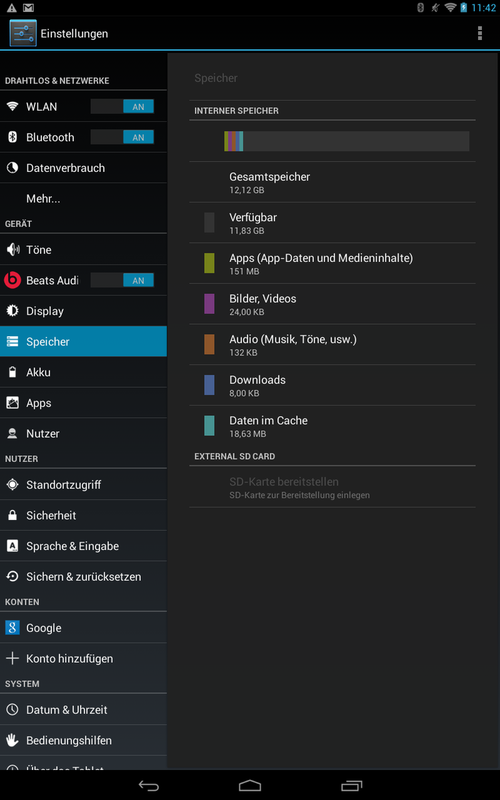 Android 4.2.2 is installed on the HP Slate 10 HD along with numerous preinstalled apps. In terms of software HP did not lay its focus on a particular field of application but treated the Slate 10 HD to a diverse but still not overloading app package. This includes, besides a number of Google applications like Gmail, Google+, Maps and Chrome, the office application Kingsoft Office as well as proprietary tools, for example HP Connected Photo and the printing solution HP ePrint. The cloud service Box with a memory capacity of 25 GB is also on-board. 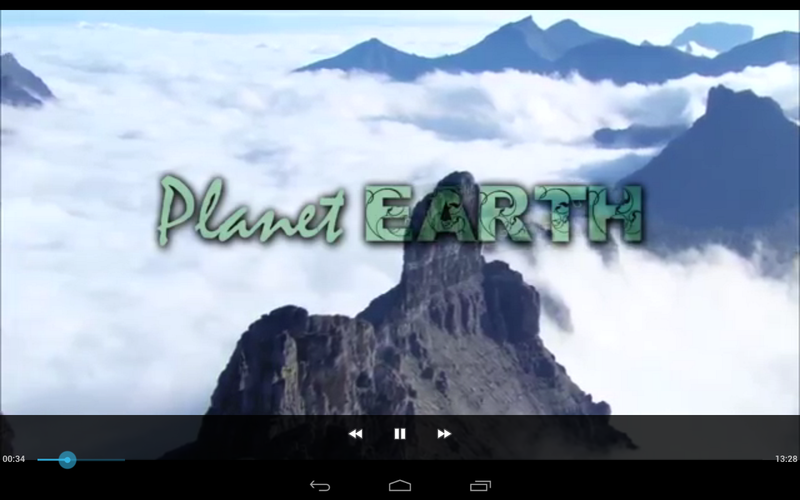 To communicate with the world the HP Slate 10 HD has a few possibilities in store. In local networks the Android tablet communicates via WLAN 802.11a/b/g/n and additionally supports Bluetooth 3.0, however, not NFC. The data exchange is restricted to local networks only because the tablet does not support mobile wireless connections and therefore is neither capable of GSM, UMTS or LTE. 3G mobile wireless is only available in the about 30 Euros (~$41) more expensive sister model HP Slate 10 HD 3603eg. The integrated GPS module secures a quick and reliable tracking of one's location, indoors as well as outdoors. During the test, we experienced neither a loss of connection nor big inaccuracies of the tracking. 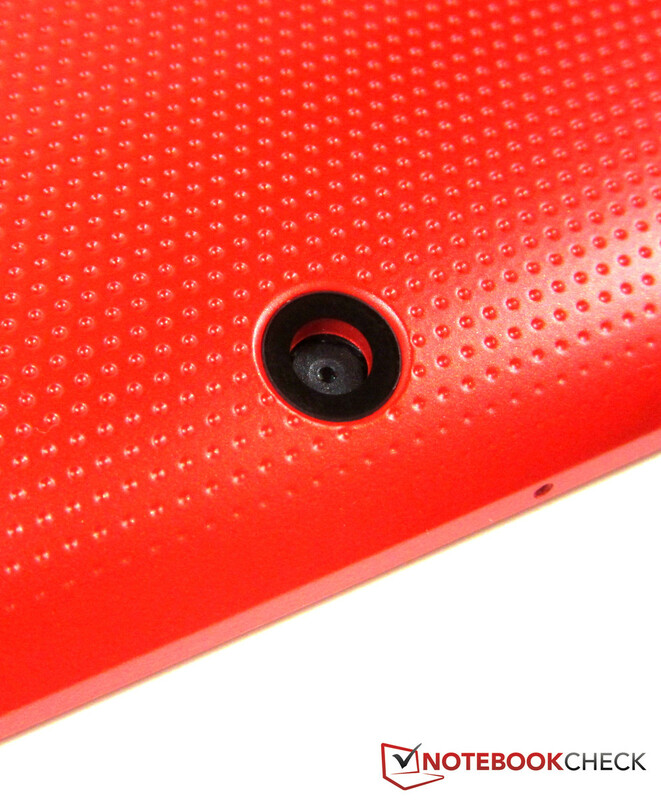 Two cameras are fitted into the HP Slate 10 HD. The main camera at the backside of the case has a resolution of 5.0 megapixels and takes pictures with a size of up to 2592x1944 pixels. 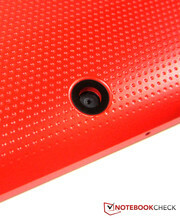 The webcam on the front side comes with a resolution of 1.9 megapixels (1600x1200 pixels). The 5 megapixel main camera takes acceptable pictures that are; however, not very rich in contrast and quickly show image noise if the lighting conditions are not completely optimal indoors. Detailed pictures cannot be expected from the webcam. Unfortunately, even with a very low bar, the images are still simply useless. For video telephony and a quick snapshot, the quality barely suffices. The tablet comes with a 12-month warranty. A fee required warranty extension for two years costs in the HP Store at least 44 Euros (~$61). The operation of the HP Slate 10 HD is quite pleasant via the capacitive multi-touch display, which recognizes up to five inputs simultaneously. Even right after booting the test candidate reacts precisely and without noteworthy delays to every command. Same goes for the three virtual Android buttons at the bottom screen edge as well as both physical buttons, the power button and the volume rocker. Single point of criticism: Both control elements are quite difficult to find, due to the strongly backwards bent sides on the backside of the case and, in addition to that, they barely poke out of the chassis. Therefore, it could happen that in the beginning the user has to constantly flip the tablet to make sure that the fingers are still at the right spot. 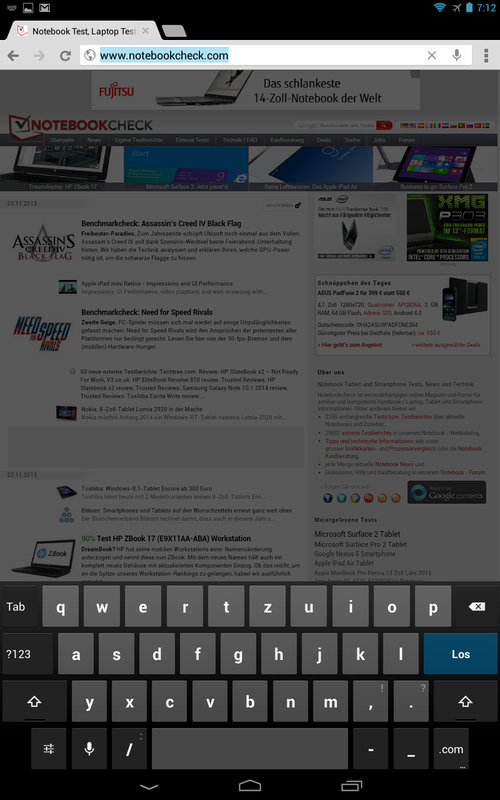 The overall positive impression of the virtual QWERTY keyboard is topped off with its generous layout. Due to the 10-inch display, every key is displayed sufficiently big in both landscape and portrait mode making it ideal for frequent writers. The 10-inch screen of the HP Slate 10 HD displays 1280x800 pixels and therefore ranges in the same resolution class as the Samsung Galaxy Tab 3 10.1 and the Lenovo IdeaTab S6000. Considerably more picture information is accommodated by the 10.1-inch tablets Asus MeMO Pad 10 FHD (1920x1200 pixels) and especially the Google Nexus 10 (2560x1600 pixels). 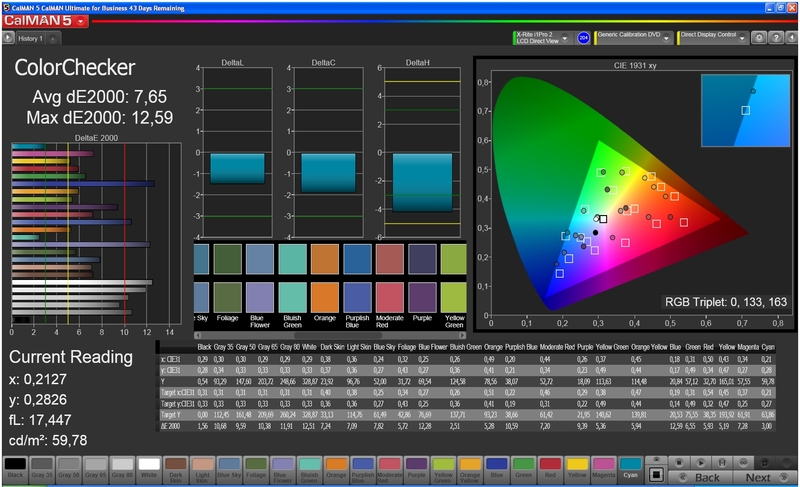 What the HP Slate 10 HD lacks in resolution it definitely makes up for with its good display values. Starting with the above average luminance of 321.9 cd/m², that is only trumped by the Google Nexus 10 (389.2 cd/m²) and the Samsung Galaxy Tab 3 10.1 (365.8 cd/m²). Moreover the brightness is distributed very evenly across the display (illumination of 86%); A quality that can also be found in the Asus MeMO Pad 10 FHD (85%) and the Google Nexus 10 (87%). Its black value of 0.32 cd/m² and its contrast ratio of 1016:1 are also very good. 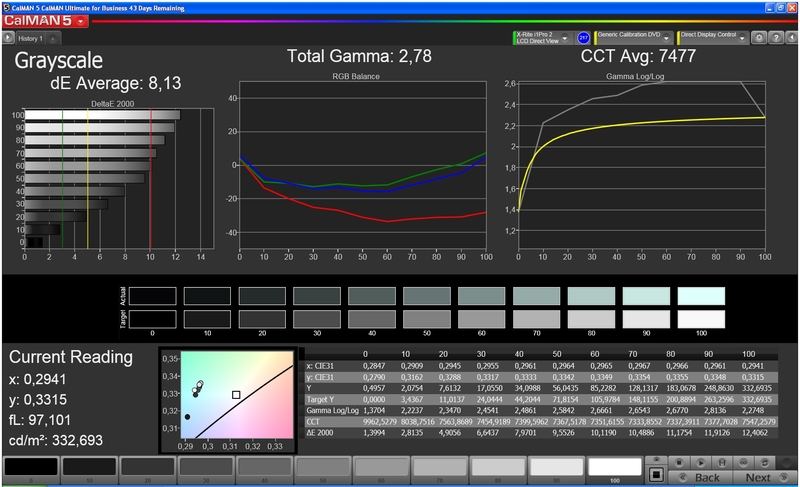 When having a closer look at the HP Slate 10 HD with the help of a colorimeter and the CalMAN software, we detect a few deficits. 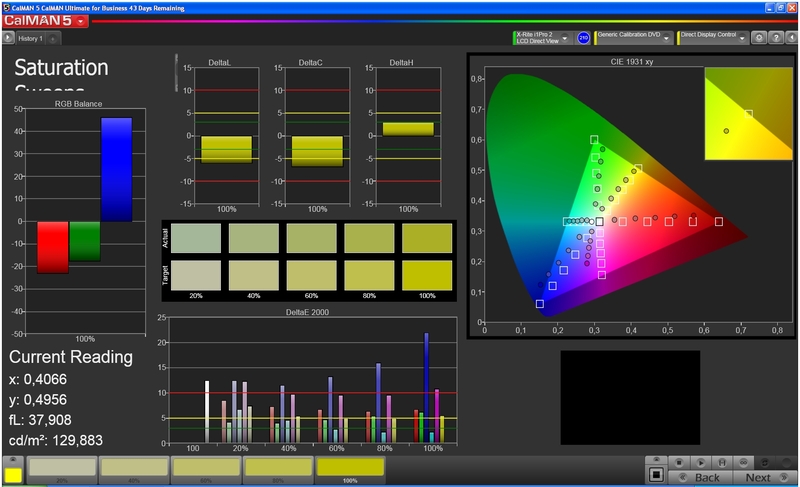 In comparison to the ideal values of the sRGB color space the tablet displays red tones way too weakly, which results in a high DeltaE value of 7.65. This trend is continued for the grayscale (DeltaE 8.139), which is more and more distorted with a rising amount of white. The detected flaws are, however, barely visible to the naked eye since all image content seems subjectively to be displayed in brilliant and vivid colors. To use mobile devices like tablets, notebooks and smartphones outdoors, their displays should feature a brightness of at least 200 cd/m². The HP Slate 10 HD takes this hurdle and is 100% suitable for outdoor use. Though the reflective display can heavily interfere with the readability of the screen under strong light, this can usually be avoided by slightly adjusting the position of the tablet. Even at extreme viewing angles the readability of the display content remains good, although the display lightens up a great deal with increasingly smaller viewing angles. This is, nevertheless, no shortcoming, especially as the colors are neither distorted nor inverted. Under normal lighting conditions it should be the reflective surfaces of the display, anyway, that have the biggest influence on the readability when looking at it from the side. The performance basis of the HP Slate 10 HD is formed by the 1.2 GHz dual-core processor Marvell PXA986 and the SoC integrated dual-core graphics chip Vivante GC1000+. Both of them are supported by a 1 GB DDR3 main memory. As the synthetic benchmarks prove, the HP Slate 10 HD is not able to enter the top league of tablets. No matter whether ranked by 3DMark 2013, GFXBench, Epic Citadel or Linpack - the 10-inch competition is almost always faster. In its defense, it needs to be mentioned that some of the performance advantages turn out to be quite small. During the browser benchmarks, the HP Slate 10 HD showed itself at its best. Although the tablet has to stand at the back of the line, it still places itself in the bottom half of the ranking and competes with the similarly fast Lenovo IdeaTab S6000. 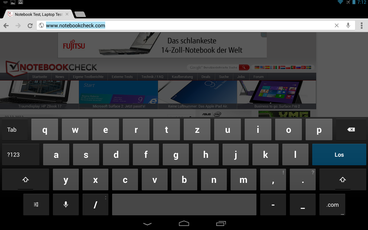 The Google Nexus 10 clearly has the edge over both of them in the browser tests. The good performance continues in the write and read benchmarks. 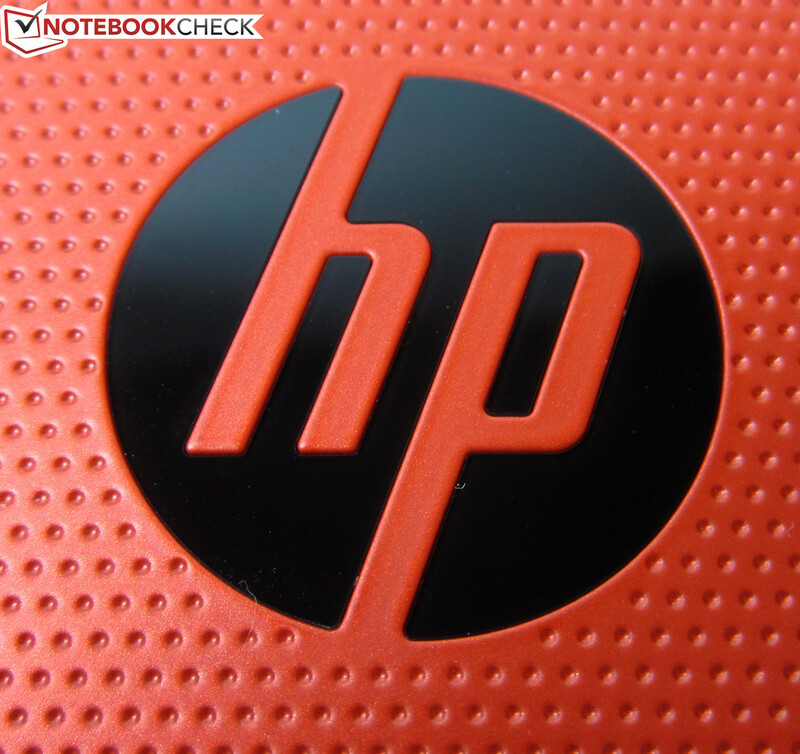 While the HP Slate 10 HD does not stick out during the sequential read and write segment and therefore only delivers below average results, it shows its strength during the random reads and writes. 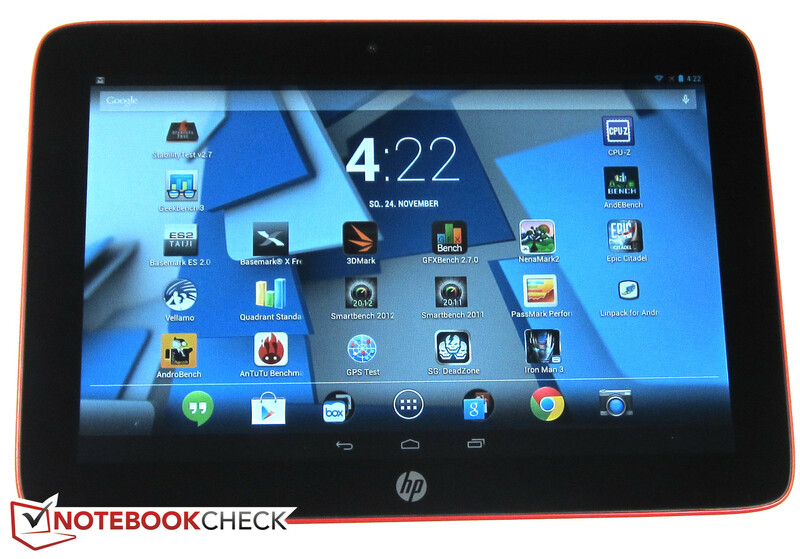 At the 4 KB random reads/writes the HP Slate 10 HD is altogether even faster than the Google Nexus 10. 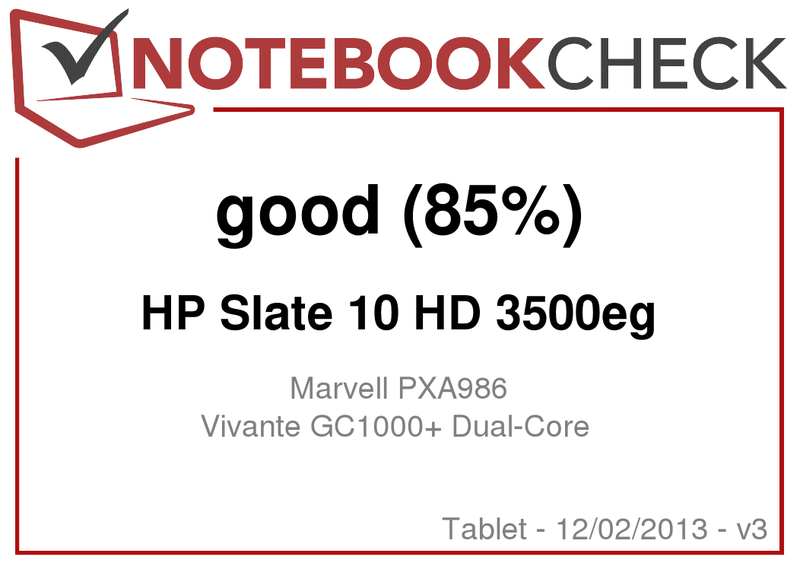 The dual-core SoC Marvell PXA986 of the HP Slate 10 HD certainly does not accomplish any performance miracles but serves the tablet as a solid performance basis. 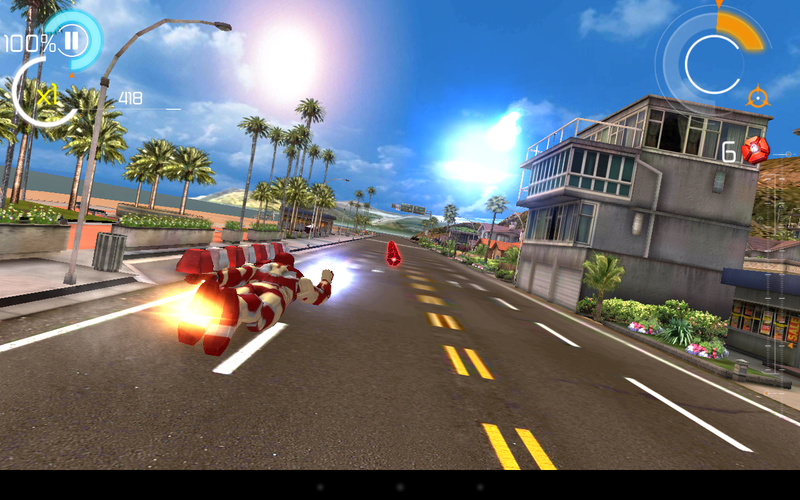 HD video material and graphically less demanding or older games like Angry Birds Star Wars or Cut the Rope are as smoothly displayed on the reflective display as current top games like Shadowgun: Deadzone or Iron Man 3. Nonetheless, action titles that involve frequent fast movements might show some minor stutters. However, this does not limit the gaming experience. 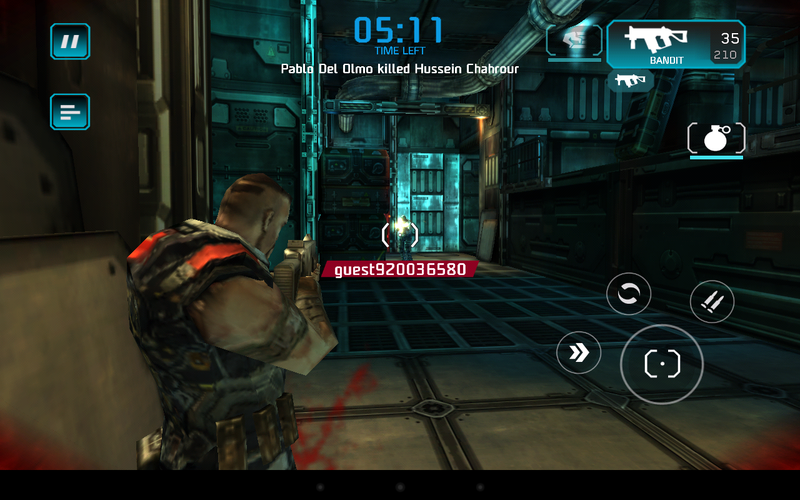 ...or fast action games like Shadowgun: Deadzone. The measured average temperature under load of 29.3 degrees Celsius (84.74 degrees Fahrenheit) proves that the HP Slate 10 HD remains cool under any test conditions. During operation the temperature rises to a maximum of 35.1 degrees Celsius (95.18 Fahrenheit) - therefore the tablet does not get any warmer than the user's hands. Only the Asus MeMO Pad 10 FHD (32.0 degrees Celsius; 89.6 Fahrenheit) and the Lenovo IdeaTab S6000 (33.6 degrees Celsius; 92.48 Fahrenheit) are able to undercut the HP Slate 10 HD. The temperature development in idle mode is beyond any doubt. The test candidate's maximum value of 26.8 degrees Celsius (80.24 Fahrenheit) cannot be considered as heating. Only the Google Nexus 10 can come close to this value with a similarly cool 28.9 degrees Celsius (84.02 Fahrenheit). 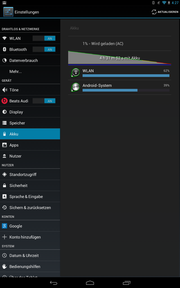 (+) The average temperature for the upper side under maximal load is 29.3 °C / 85 F, compared to the average of 30.7 °C / 87 F for the devices in the class Tablet. Nothing less than the "highest sound quality" is what HP promises on its website for the Slate 10 HD. 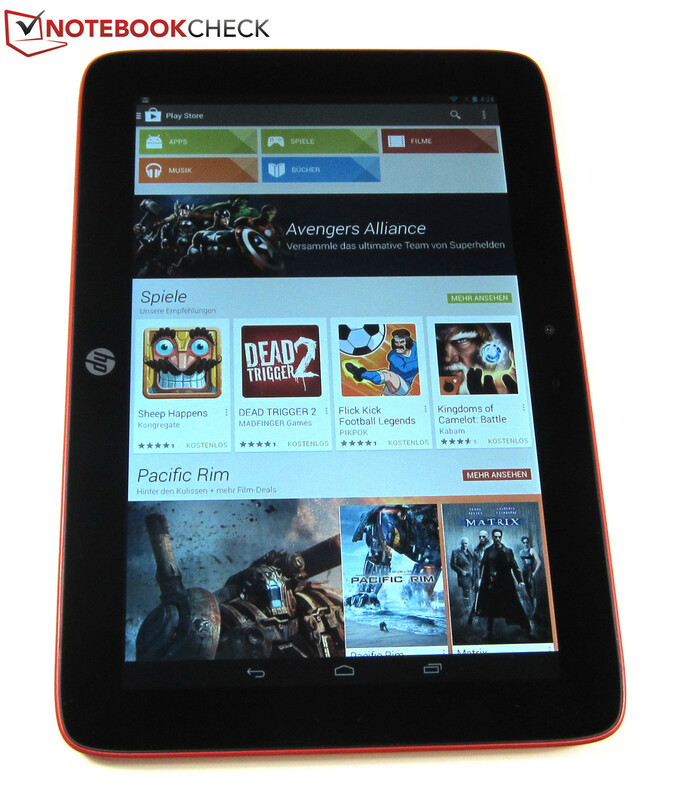 The necessary basic equipment is available: The Android tablet has stereo speakers at its disposal and is equipped with the HD sound system Beats Audio, whose logo is clearly visible on the backside of the device. In the test, the speakers delivered good sound quality indeed and did not distort even at maximum volume. However, even with Beats Audio function turned on, mids and especially lows are missing. A clearly audible improvement by the HD sound system is only achieved with headphones - then mid- and low-range sounds are much more prominently represented. 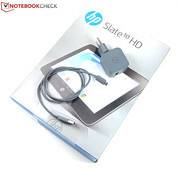 Unfortunately, HP does not include headphones for the Slate 10. With its non-interchangeable 26 Wh battery the HP Slate 10 HD has a solid foundation for long battery runtimes. How well or badly the tablet performs also heavily depends on the amount of power it needs during operation according to the operation scenario or application. In idle mode, the maximum consumption is 4.1 Watts, which qualifies the HP Slate 10 HD as an energy-efficient 10-inch tablet. 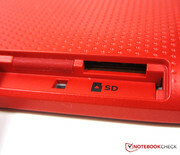 The Lenovo IdeaTab S6000, with its 3.1 Watts, still requires less power. 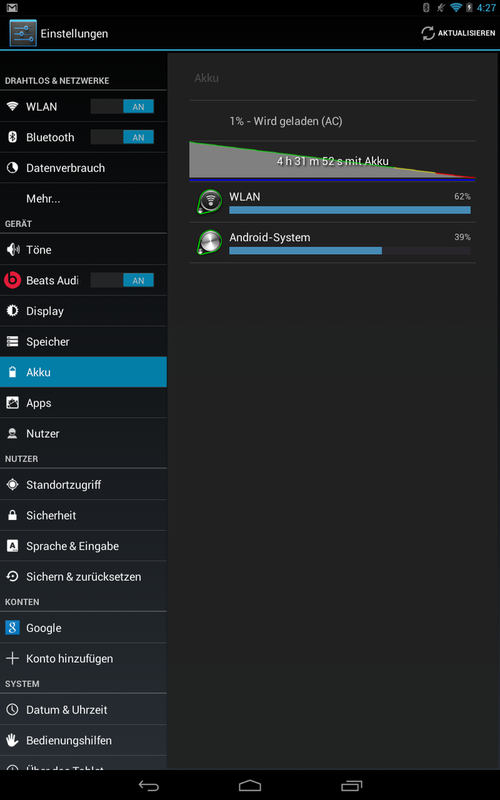 The Google Nexus 10 even needs up to 9 Watts. Under load, the power consumption rises to a maximum of 7.1 Watts, which is another convincingly low value. Once again, the Lenovo IdeaTab S6000 goes easier on the battery (4.8 Watts). The Google Nexus 10 (9.4 Watts) and the Asus MeMO Pad 10 FHD (10.2 Watts) are, in contrast, thirsty for a lot of power. Concerning maximum battery runtime (minimum display brightness, activated energy-saving function, all wireless technologies except WLAN deactivated), the HP Slate 10 HD delivers with 18 hours and 22 minutes the longest battery runtime among the reference devices. While the Google Nexus 10 (17 hours and 10 minutes) proves to be similarly enduring, the display of the Asus MeMO Pad 10 FHD turns black after only 12 hours and 18 minutes. Under maximum load (maximum display brightness, all wireless modules activated) the HP Slate 10 HD delivers with 4 hours and 32 minutes, at most an average performance. Three of the four 10-inch tablets are better with the Lenovo IdeaTab S6000 at 5 hours and 47 minutes leading the way. Also in front of the HP Slate 10 HD are the Asus MeMO Pad 10 FHD (5 hours and 18 minutes) and the Samsung Galaxy Tab 3 10.1 (4 hours and 43 minutes). The battery runtime results of the WLAN test usually show big differences to the manufacturer's information (display brightness of 150 cd/m², energy-saving mode activated, automated call up of websites every 40 seconds) because the test does not simulate laboratory conditions but tries to simulate as realistic a user behavior as possible. The HP Slate 10 HD comes off well with 8 hours and 10 minutes, however, once again three devices are better: Google Nexus 10 (10 hours and 53 minutes), Samsung Galaxy Tab 3 10.1 (9 hours and 3 minutes) and Lenovo IdeaTab S6000 (8 hours and 44 minutes). 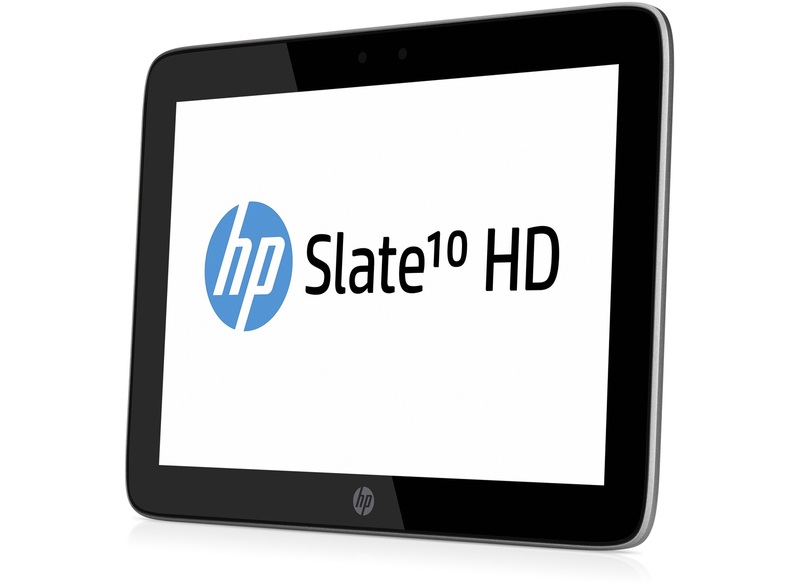 HP delivered on its promise for the Slate 10 HD. 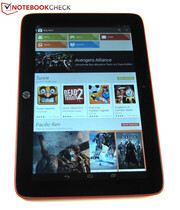 The 10-inch tablet fulfills its self-defined aspiration to be a multimedia entertainment station. 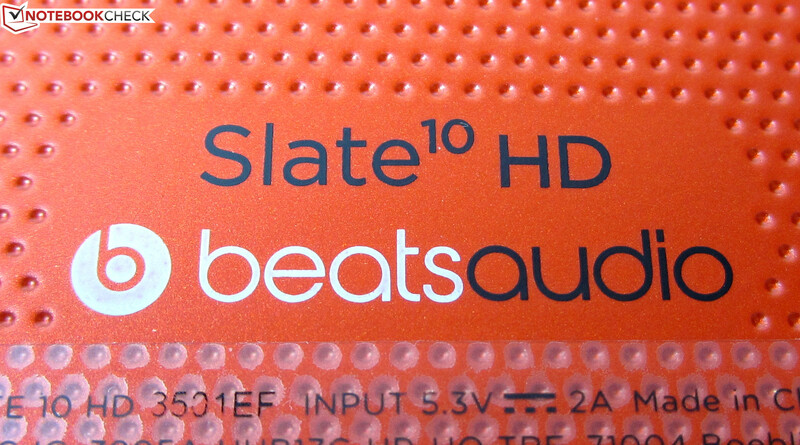 HD videos are played back smoothly by the Slate 10 HD, though only the small HD version is displayed due to its display resolution of 1280x800 pixels. The dual-core SoC Marvel PXA986 ensures a flawless playback, which is also true for the operation of the Android 4.2.2 - no noteworthy delays or long loading times were observed. Within the realms of its limited possibilities the stereo speakers produce a full sound when the HD sound system Beats Audio is activated. It would even sound better with headphones; however, they are not part of the equipment of the Slate 10 HD. In return, the HP tablet offers about 12 GB of available memory space, a lot of capacity for data. Apart from the multimedia aspect, however, the HP Slate 10 HD does not have much exceptional to offer: Sure, the display scores with good presentation qualities, the 5-megapixel camera (but not the webcam) takes adequate pictures and the battery runtimes are beyond any doubt. The SoC displays current games smoothly but the HP tablet will most certainly not have enough power reserves for the next generation of games. In addition to that, there is no mobile wireless module available despite the price of about 300 Euros (~$413). Therefore, the Slate 10 HD is limited to WLAN 802.11a/b/g/n and Bluetooth 3.0. In Review: HP Slate 10 HD 3500eg. Test sample courtesy of HP. 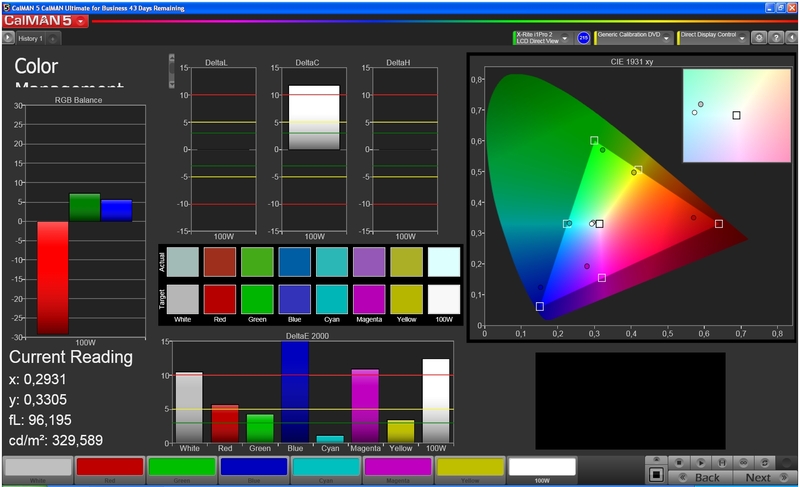 The multitouch capable IPS panel has a resolution of 1,280 x 800 pixels. 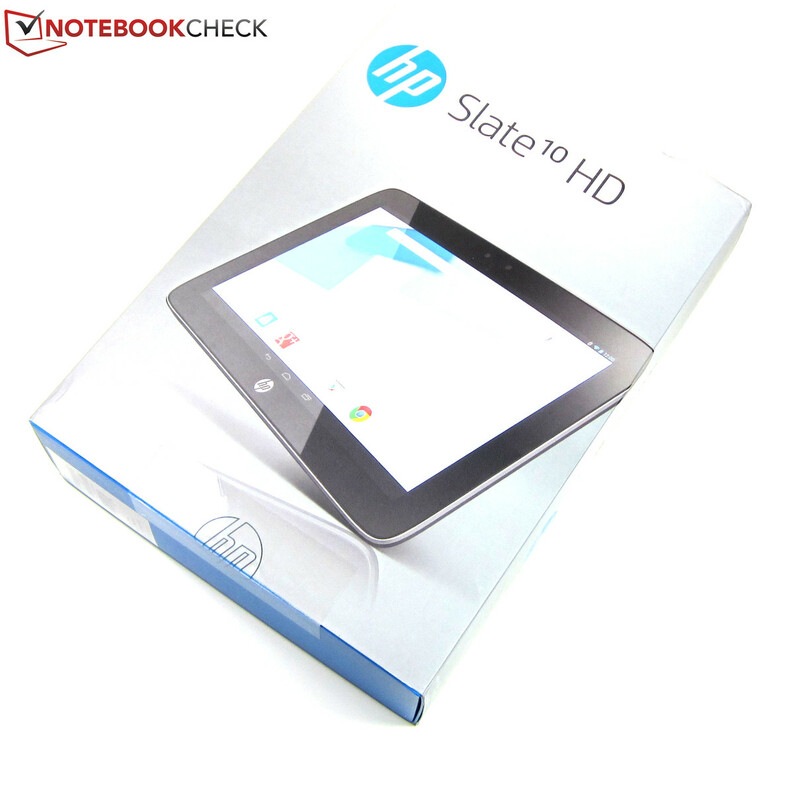 Wrong color: In Europe HP offers the Slate 10 HD only with a silver-colored back cover. 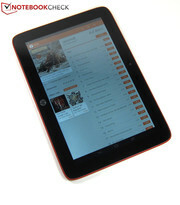 Due to its big display, the tablet can be controlled easily. Corners and edges at the back side of the case was rounded off. The HP Slate 10 HD convinces with good display qualities. Unfortunately, the HP tablet does not support any mobile wireless connections. The main camera takes pictures with up to 5 megapixels (2,592 x 1,944 pixels). The webcam has at least a resolution of 1.9 megapixels (1,600 x 1,200). 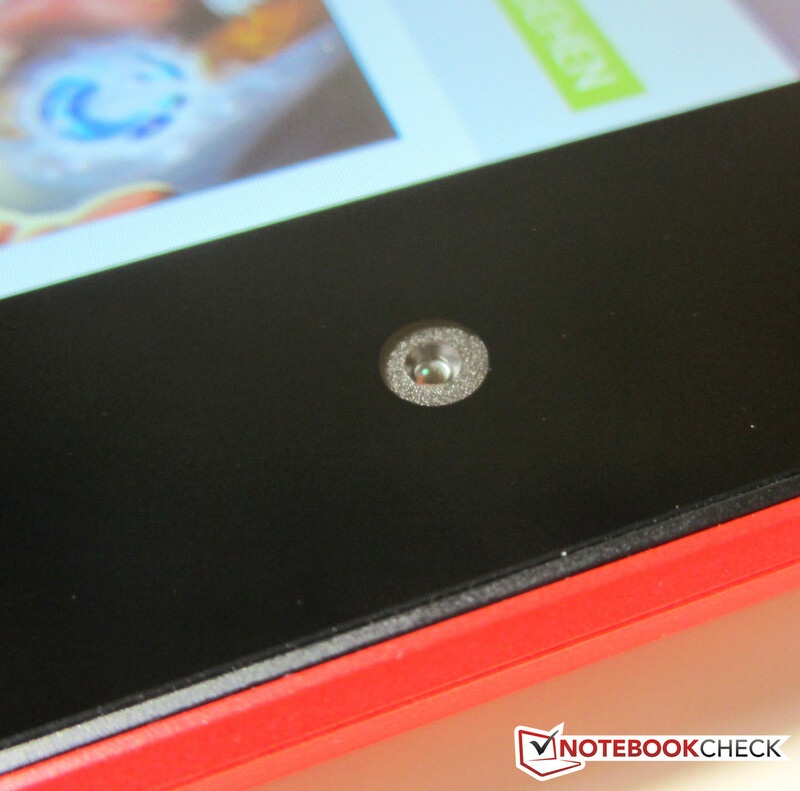 With a design height of 9.7 millimeters the HP Slate 10 HD is slightly thicker than comparable 10-inch tablets. The HD sound system Beats Audio creates a fuller sound. The back cover is non-removable. 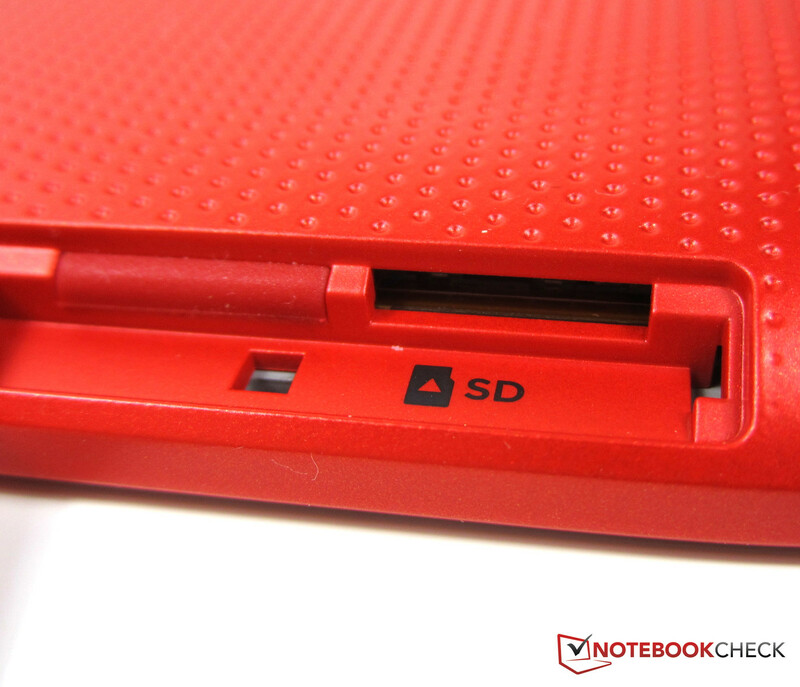 On the left side of the device a slot for a MicroSD card of up to 32 GB is located. ...a modular power supply, a Micro-USB cable and a quick start guide. At start-up about 12 GB are left of the nominal 16 GB memory capacity. Android 4.2.2 runs on the HP Slate HD. At full load the battery lasts for 4 hours and 32 minutes. 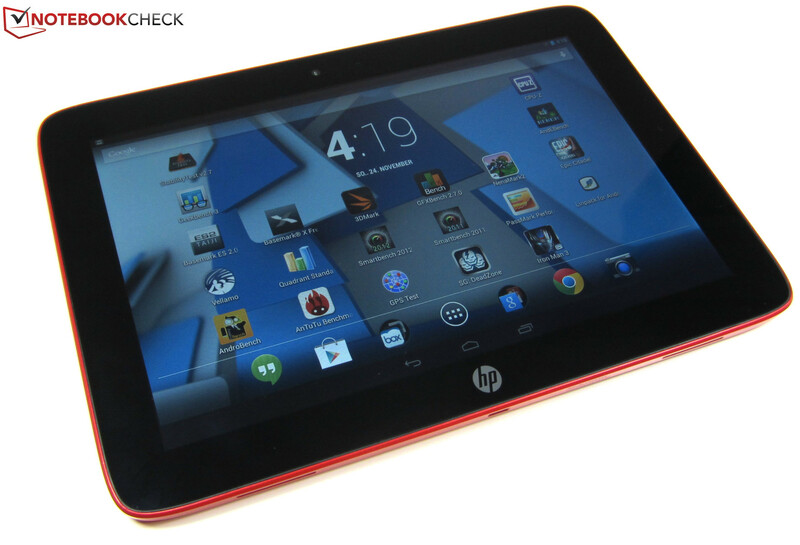 HP offers with the Slate 10 a solid 10-inch tablet that convinces with good workmanship. Better communication equipment, especially a mobile wireless module. The HP Slate 10 can only exclusively connect with WLAN networks and exchange data via Bluetooth.